Football shirts, an essential part of a football fans wardrobe, we wear them with pride, we wear them to death and when they are no longer in the condition acceptable to wear in public they make great house shirts to wear for any situation. I have gone through my fair share of football shirts over the years, mainly arsenal shirts but a few random purchases have snuck into my collection. I own an Olympiacos shirt that cost me the grand total of £2 from the bargain bucket at sports direct last year. Too good a bargain to turn down, no logo on the front just the badge and kit maker logo, only a fan of Olympiacos would recognize it for me it’s a handy option for my 5 a side footie sessions. With the prices of shirts and the frequency they are churned out at arsenal I don’t even own the current home or away shirt. The tight wad in me is happy to purchase the previous seasons jersey when they hit clearance prices to make way for the latest. Either that or the Christmas/January sales entice me to part with my cash. One thing that I had stopped doing was purchasing shirts with players’ names on the back. The reasoning behind this wasn’t to save the pennies but the fact that every player I put on the back left us. There’s nothing worse than having a player leave and then you are stuck walking around with an ex players name stuck there much like the indignity of having an ex partners name tattooed on your body. During the good times I purchased a shirt with Henry printed on the back – gone, Vieira – gone, Pires – gone, Reyes (don’t laugh) – gone. You can almost get away with most of those shirts when certain players carry legendary status with your club. Most of the names I mentioned carry high esteem amongst gunners long after they are gone and so their significance isn’t reduced. Though I am pretty sure there are a high number of fans out there that have possession of a shirt with Samir Nasri’s name across the back, possibly Adebayor too. When players leave on acrimonious terms and you are left with a shirt carrying their name you might as well throw that shirt in the corner of the bathroom lying in wait for when the toilet needs a good scrubbing. Maybe the letters can be removed, I’ve never tried so don’t know how successful that is. Now to my dilemma, earlier in the season upon one of my frequent visits to emirates I decided to have a look around the armoury store. I believe this was after one of the u-21 games that were hosted at the emirates. With only five thousand or so fans turning up that day the area was a lot less congested and the store had a more bearable number of people browsing. Normally on a match day the armoury can be so packed there is no room to breathe let alone move around. So on this day I was able to have a look around and take my time, I had no intention to purchase anything but it doesn’t harm to have a look. It was here where I spotted the shirt; it was a Brazil shirt, the latest shirt going for £25. the drawback? It has A. Santos and 11 on the back. Now I am a massive fan of Brazil, have always admired their football and the quality players they have churned out since forever. To own a Brazil shirt has been something I have always considered however I could never justify the purchase due to the price of the shirt. You never get a Brazil shirt for a reasonable price even the older shirts hold their price so to see that the current shirt is available at such a price I just couldn’t turn up the opportunity. 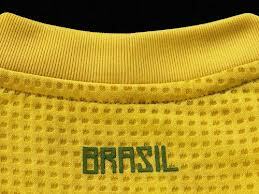 I know it was going against my name on the back policy but I was getting a Brazil shirt. Santos was still popular amongst the fans; the speeding incident with the police was still fresh and probably endeared Santos even more to the gunner’s fans. So I bought the shirt, well happy with my purchase I wore it to my next home game I attended. Fast forward a couple of months and Andre Santos can do nothing right at the moment. His mixed performances since coming into the side because of Kieran Gibbs injury have almost turned him into the pantomime villain amongst arsenal fans. Much like favour turned sour with Emmanuel Eboue once results stopped going our way a similar situation has developed with Santos and it seems it will take a hell of a lot of hard work to win back favour with the arsenal fans. His confidence is low at the moment and his morale must have been shattered to pieces when Arsene decided to drop Santos in favour of playing Vermaelen out of position in the left back role. Not a good sign when a player being shifted out of position is preferred in your specialist position. That is probably the biggest sign yet that Andre Santos’s arsenal career is on borrowed time. He has every chance between now and the next transfer window to turn things around but at present it seems a hard task. So this now leaves me in a situation where I have the Brazil shirt I always wanted but the name of Andre Santos on the back which is likely to result is some heckling from football fans. The weather has changed now so im less likely to wear a football shirt fully exposed, the cold in the stands will ensure I am well wrapped up and any shirt I wear will be covered up. However the times I do wear my shirt fully out in all its glory will I be hiding my back to avoid being seen? I suppose when you look at it in the grand scheme of things if every arsenal fan was offered a football shirt with any current players name printed on the back for free what percentage of those fans would request a Santos shirt? Maybe 2-3%? In a way the shirt is unique and maybe I should celebrate the fact I stand out from the thousands of Cazorla and Wilshere shirts. I spent a season sharing a season ticket for a seat behind a bloke who brought a massive sheet to every game saying ‘Eboue is my homeboy’ funnily enough Eboue would spot this guy every game and on more than one occasion he would go over to the guy at the end of the game and give him his shirt. I used to look on enviously that this guy got the attention just for holding up a flag but he was bold enough to show his support for an out of favour player. 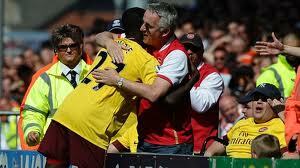 The same bloke probably jumped off the nearest bridge when Eboue left. Could Santos be my Eboue is my homeboy? At a time where he is public enemy number one maybe I should put on my shirt with pride, decorate my bed sheet with an encouraging message for Santos and display it at all the games I go to. It might inspire his performances; he may also donate one of his XXL shirts to me. Saturday is here at last, my god it’s been a long wait. International football has had its turn, overstayed its welcome but now we can get back into the routine. Despite pulling out its trump card and honouring us with a Wednesday game due to rain, roofs and all sorts we all wanted it over and out the way. Next up for the gunners is Norwich at Carrow road, a game on paper we should win but a game based on last seasons’ battles will be hard fought and the boys will have to be on it from the off. I have a personal interest in beating Norwich after my experience in the game at emirates last season. That game happened to be the closest I have ever sat to away fans and it really got the blood pumping though the ups and downs. The banter was full on and I found it hard to take when their fans were goading us. Although we didn’t lose the game the draw at the time put our champions league fate in the hands of other teams and the Norwich fans weren’t holding back with their rendition of the ‘Thursday nights channel five’ song. Luckily for us Spurs and Newcastle tried their best to outdo us in the crap results competition. Like a kid that wants to get one up on their rival I will not be happy unless we achieve 6 points from the canaries this season. Today’s game will be the start for me and the return game at emirates will be the icing on the cake. I want to give it back to their fans; I owe it to them to rub it in their faces. Now with the personal rant over, the standout topic of the team news that has been resonating since yesterday afternoon is the news that Jack Wilshere has been included in the match day squad for today’s game. Arsene did his best to play down any talk of jack playing before our carling Capital One cup fixture at the end of the month however Jack’s agent had a different idea. Through Twitter his agent Simon Bayliff let the cat out of the bag that the midfielder has indeed been included in the squad travelling to Norfolk. That surely didn’t go down well with the folk at arsenal, teams news should really be revealed by the people in charge i.e. wenger. 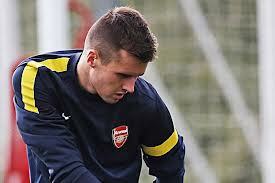 Jack’s agent will be sure to hear from the arsenal men about his future tweets regarding his client. Being in the match day squad is no guarantee Jack will even be on the bench for the game today. Wenger could have been telling the truth about his plans for jack and his involvement in the squad could be merely part of the process of integrating him back into the old routine. There’s no guarantee his inclusion is blocking any current fit players, there are sure to be a few spaces due to injuries to some key personnel. I would not expect jack to be involved today even if he is named as sub (unless we are cruising 4-0 ahead with 10 minutes to go). I see no need to rush him back any sooner than needed though I wouldn’t be surprised if the player himself is screaming for the chance to pull on the jersey again for a top flight game. From the rest of the squad there is no surprise that Theo Walcott will not be involved, Kieran Gibbs looks to miss out after the injury that ruled him out of the England squad hasn’t cleared up yet. The goalkeeping situation hasn’t changed so Mannone will be between the sticks and at the back Koscienly is a doubt but not ruled out, a late fitness check will probably decide on his involvement today. 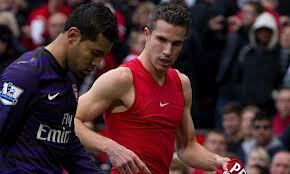 In today’s team I’m hoping Andre Santos can seize this opportunity, he has been very much a peripheral figure so far this season due to the form of Gibbs so I’m hoping he can take note of Carl Jenkinson on the other flank and give Wenger some future headache problems. Olivier Giroud will be going into the game with full confidence after his goal at west ham before the break and his midweek goal against Spain. 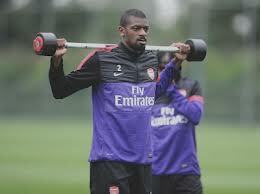 If he starts the Norwich defence will have a game on their hands. They got Grant Holt but we’ve got Giroud, No comparison really. With all the talk focused on Jack Wilshere it is not known if Bacary Sagna is included in the squad also. Both players completed 90 minutes in midweek and I would place both at the same stage in their recovery. I suppose the one sticking point is would Wenger risk Sagna’s first game to be against the very team his leg was broken against? probably not but the Frenchman is not far away from 1st team duties. Enjoy your day people. Wish the gunners luck on operation Norwich 6 points.